Abandoned 1932/1933 due to age and deterioration. Depth of hold 32' 9"
Propulsion: One 2.500ihp steam engine, one shaft. 76k Fitting out at the Chester Shipbuilding Company shipyard, Chester, Pennsylvania, 20 October 1918. Courtesy of Donald M. McPherson, 1974. The first Auburn (Id. No. 3842) was probably named for the town of Auburn, Pa., situated on a tributary of the Little Schuykill River, Schuykill County, northwest of Chester, Pa., where the ship was built; the second Auburn (AGC-10) was named for Mount Auburn, northwest of Cambridge, Mass. The name itself is found in Oliver Goldsmith's long poem, "The Deserted Village" (1770). 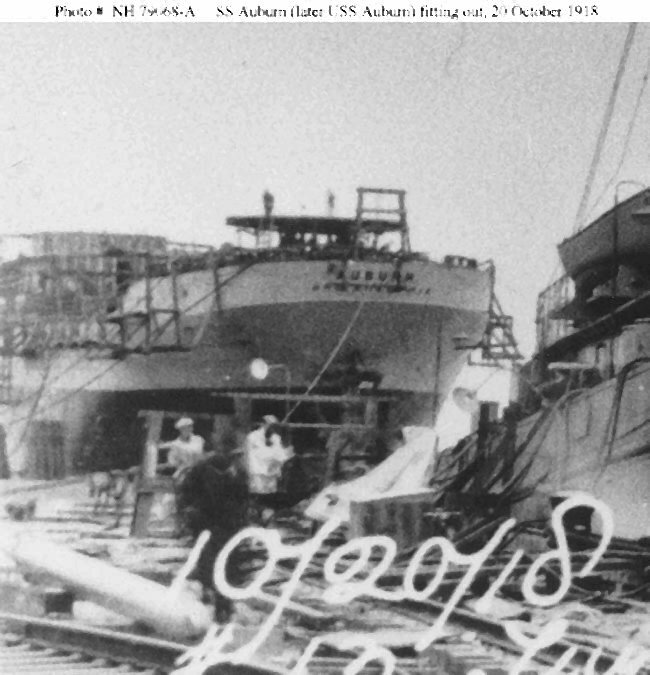 The first Auburn-a steel-hulled freighter built for the United States Shipping Board (USSB) at Chester, Pa., by the Chester Shipbuilding Co. and completed in 1918-was delivered to the Navy by the USSB for service in the Naval Overseas Transportation Service (NOTS). Assigned the identification number (Id. No.) 3842, Auburn was commissioned at Philadelphia on the afternoon of 24 January 1919, Lt. Comdr. Fred L. Moulton, USNRF, in command. Two days later, the cargo ship got underway for New York harbor; proceeded down Delaware Bay; and ultimately dropped anchor off Tompkinsville, Staten Island, on the morning of 27 January. After initially shifting to Bush Terminal pier, South Brooklyn, on the 29th, she moored at pier 61, North River, New York City, on 2 February. There, she loaded 5,236 tons of general cargo (including a large quantity of wheat flour) and prepared for her maiden voyage. However, her engineers discovered several split condenser tubes in her boilers before the trip could begin, and an inspection board convened and visited the ship on 15 February. After a brief period of repairs, Auburn shifted to pier 16, South Brooklyn, on the 17th. By that point, the Navy had apparently decided to demobilize the ship; and, on the afternoon of Washington's Birthday, 22 February 1919, representatives of the USSB accepted custody of the ship when she was decommissioned. Auburn's subsequent career, like hers under the aegis of NOTS, was brief. She remained in the USSB fleet into the early 1930's, very probably laid up due to postwar austerity measures in the American merchant marine. Then, around 1932-1933, she was "abandoned ... due to age and deterioration."